Did you know that luxury vinyl flooring is becoming one of the most popular types of flooring being installed in homes all over America? There are some very good reasons why so many homeowners are turning to luxury vinyl, and we would like to share a few of those with you now. One reason why so many homeowners turn to luxury vinyl is for its beauty. You can find these flooring systems in either tile or plank form. The tile format allows you to get the look of natural stone, such as travertine, marble, granite, slate, and others. The plank format allows you to get a wood-look floor in species such as oak, elm, mahogany, and many others. Luxury vinyl tile and plank are so authentic looking that it can be very hard to tell them from the real thing. The only way to truly appreciate how authentic these flooring systems are, is to see them for yourself. When it comes to buying a durable and strong flooring system, you would be hard pressed to find another system that matches luxury vinyl. These flooring systems are constructed with strength and durability in mind. They resist staining and denting, and they are very easy to clean and maintain. You may think that with so many benefits luxury vinyl would be expensive. Not true. These flooring systems are very affordable, and most homeowners can easily afford them. 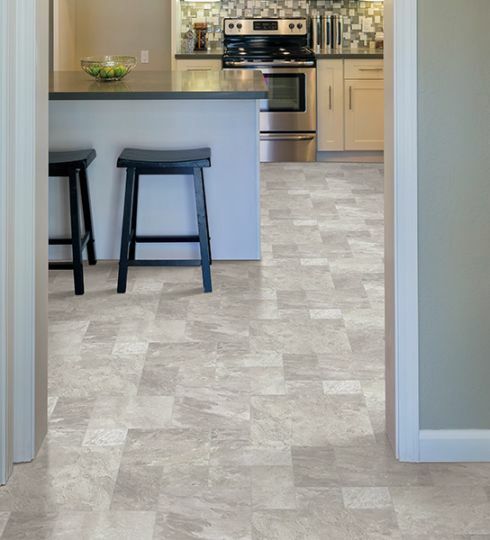 Luxury vinyl tile (LVT) and luxury vinyl plank (LVP) are available in a variety of price points. If you are looking for a remarkable flooring system that is perfect for homes with active kids and pets, we suggest you look into LVT and LVP. Why not come by Covering Broadway in Red Lodge, MT and see our great selection of luxury vinyl today; and remember we serve Belfry, Roberts, Bridger, Roscoe-Luther, Billings, Absarokee, Columbus as well.